The bleak, precise, sombre novels of Phyllis Paul have been sought-after in recent years, ever since Glen Cavaliero discovered her work, recognised its strange qualities, and began to write about it. They remain quite hard to find, so it's welcome that The Sundial Press of Dorset have just reprinted her 'A Cage for the Nightingale' (1957), with an introduction by Glen Cavaliero, who points out that this is the first reissue of her work since her death nearly forty years ago. Her novels, he notes, "plumb spiritual depths as harrowing and violent as those of Jacobean tragedy": while Elizabeth Jane Howard, quoted on the dustjacket, reaches even further back, evoking "An almost medieval sense of good and ill". What distinguishes her books is the contrast between the meticulous, correct, shrewdly-observed prose and the stark tragedies and villainies she describes so remorselessly. 'We Are Spoiled' was the title of another of her books, and this sense of humanity as doomed to an existence of sly little evils and weak acquiesence in viciousness permeates all her writing. 'A Cage for the Nightingale' has at its heart a young woman's hesitant quest for the truth about a mysterious death some years before, and the ambiguous roles and attitudes of those around her in the country house where she is a paid companion. The story is well-contrived, with the reader often left in doubt about any explanation. But what pervades the book most of all is a sense of so many shadows, not just in the house and its grounds, but in the conscience of each character - and of greater shadows in a half-lit world beyond. In Wormwood no. 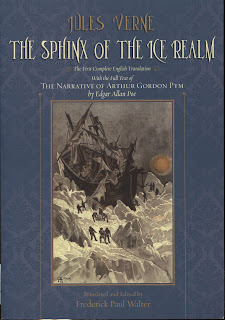 16 (May 2011), one of my "Late Reviews" covered Jules Verne's sequel to Poe's The Narrative of Arthur Gordon Pym of Nantucket (1838), entitled Les Sphinx des Glaces (1897), based on reading the 1898 translation by Mrs. Cashel Hoey. I will copy my "Late Review" below, but here I'd like to call attention to "the first complete English translation" of the book, recently published by the State University of New York Press. Translated and edited by Frederick Paul Walter, it contains not only a full translation of the book (noting on page 387 that Mrs. Hoey's version is "heavily abridged, chopping some 36% of Verne's original", and that her edition "features a number of careless mistranslations, retitles chapters, interpolates passages, fabricates notes, and reorganizes Part Two by shoehorning sixteen chapters into ten"), but also includes the full text of Poe's short novel as one appendix, and a translation of the section on Pym from Verne's 1864 article "Edgar Poe et ses œvres" from the magazine La Musée des familles. Seventeen illustrations also appear, and I recognize most of them from the old translation I read. The new complete text must now be considered the preferred edition. Copies are available in an oversize trade paperback edition, very reasonably priced, via Amazon, click here, and Amazon UK, click here. I wonder whether reading the full text would alter my original opinion of the book, which I did not know was abridged at the time I read it. Verne, Jules. An Antarctic Mystery (Philadelphia: J. B. Lippincott Company, 1899). Translated from the French by Mrs. Cashel Hoey. 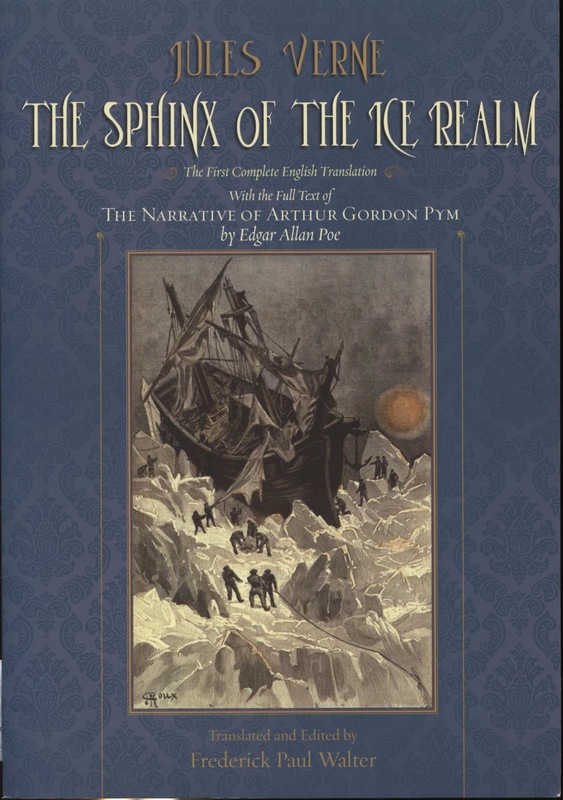 In an article on the works of Edgar Allan Poe published in La Musée des familles, Avril 1864, Jules Verne (1828-1905) observed of Poe’s The Narrative of Arthur Gordon Pym of Nantucket (1838) that “the story of Pym’s adventures breaks off in mid-air. Who will take it up again? Someone bolder and more daring than I, who does not fear to launch himself into a sphere of the impossible.” Thirty years later Verne himself did just that, in Le Sphinx des Glaces (1897), which first appeared in English as a serial, beginning in 1898, in The Boy’s Own Paper under the title Captain Len Guy; or, An Antarctic Mystery. It was subsequently collected in The Boy’s Own Annual for 1899, and also came out as a separate volume, re-titled An Antarctic Mystery, from Sampson Low, Marston and Company, London, around October 1898, with a U.S. edition, published by Lippincott, a month later (though it is dated 1899). Sadly, none of these versions use Verne’s more poetic French title, which in English would be Sphinx of the Ice-Fields. Poe’s masterful narrative is open-ended, deliberately lacking closure so as to leave the mysteries foremost in the reader’s mind. Inevitably this invites others to write continuations of the story, and the attempts made to explain Poe’s mysteries are inevitably disappointing. 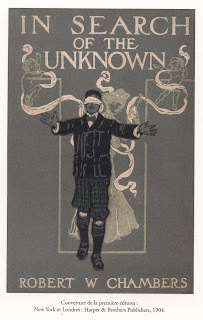 Verne’s sequel was the first published, beating out Charles Romyn Dake’s A Strange Discovery (1899) by a matter of months, though it seems likely that both were being written around the same time. And both Verne and Dake hinged their sequels on the supposed reality of the character of Dirk Peters, Pym’s companion, who according to Poe’s note at the end of the book was still alive in 1838, a resident of Illinois. Verne’s story is set some eleven years after Poe’s. Captain Len Guy of the Halbrane is the brother of the Captain Guy who sailed with Pym, and Len Guy has come to believe that his brother, and others of the ill-fated expedition, may still be alive. The book is narrated by a Mr. Jeorling, who takes passage on the Halbrane and though initially skeptical becomes convinced of the truth of Poe’s narrative, supporting Captain Guy in his search for his lost brother. Any sequel to Pym is almost by its nature bound to rehash familiar material, as the new expedition retraces the steps of the earlier one, moving farther and farther south towards the pole and Pym’s mysterious end. 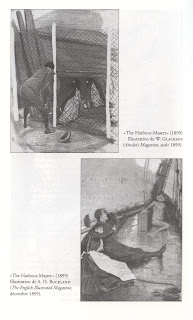 Verne adds new hardships for the crew of the Halbrane to overcome, including mutiny and the capture of the Halbrane by a rolling iceberg, leading to its complete destruction. One mysterious crewman of the Halbrane turns out to be the half-breed Dirk Peters, Pym’s companion, who reveals that contrary to what Poe published, Pym never returned to America but drifted off in the Antarctic, after he and Peters had become separated. Verne brings the story to an implausible conclusion. Captain Guy eventually find his brother, and the enormous Sphinx they encounter is revealed to be a lodestone—an enormous magnet. Pym’s frozen and dead body is discovered six feet up the Sphinx, magnetically bound by the iron of the gun which he carried over his shoulder. Dirk Peters falls dead of grief. Both as a novel in its own right and as a sequel to Pym, Verne’s story is unsatisfying. A weak work written in Verne’s old age, his own earlier imaginative writings are much, much better. 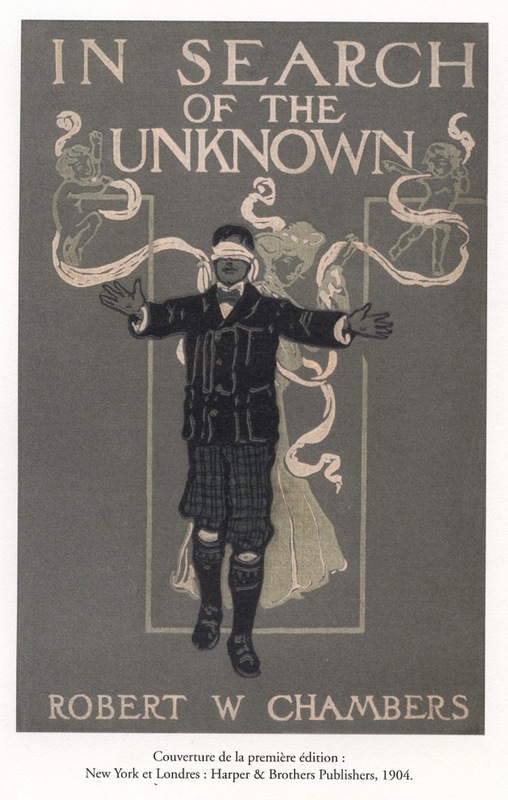 Our friends at Le Visage Vert have recently released the definitive French edition of Robert W. Chamber's fix-up, In Search of the Unknown (1904), which combines six previously published Chambers stories into a novel. 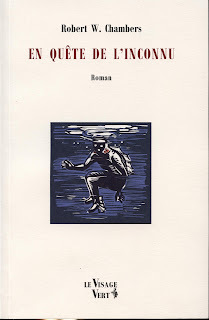 Here it is translated by Jean-Daniel Brèque, with a nice cover illustration by Marc Brunier-Mestas. But the added material is what makes this edition special. Michel Meurger contributes a forty-five page afterword on "The Lost World of the Bronx Park", which is heavily illustrated and gives the background for Chambers's zoological researchers in his novel. 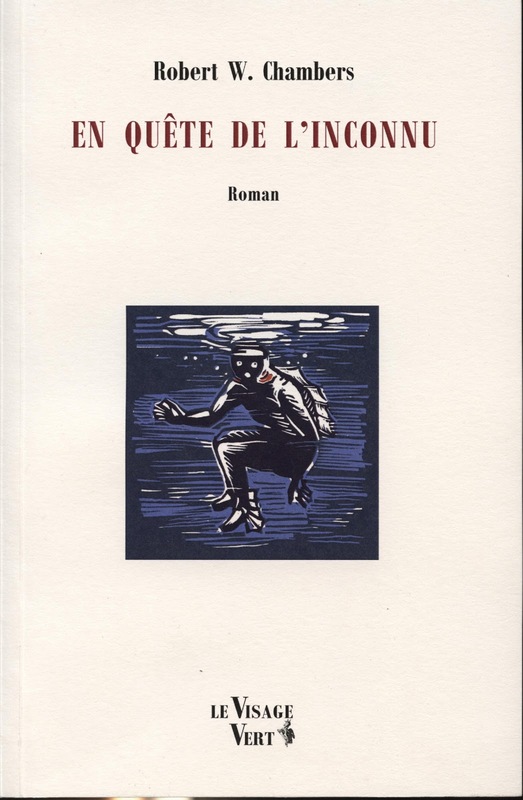 Xavier Legrand-Ferronnière adds a bibliographical appendix which cites all of the appearances of the six stories, from their first appearances in periodicals on to reprints in later anthologies. As usual with LVV productions, this is a bibliophiliac's delight. Ordering information and other details at their website here (scroll down). Illustrations from the magazine appearances of "The Harbour-Master"